Purchase 50 or more EuroSplint s and download your free support pack worth £100. Purchase 200 or more EuroSplint s and you can have personalised covers absolutely free! 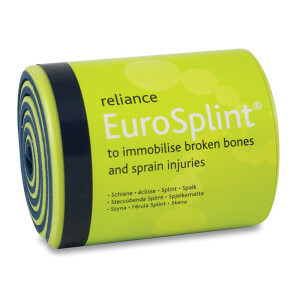 The EuroSplint is an incredibly versatile product and is used to immobilise broken bones and sprain injuries. The splint can be shaped to suit the injured part of the body and held in place by loosely wrapping a bandage or tape around the splint. It can be used on the neck, shoulders, arms, fingers, wrist, knee, legs and ankles. Special Metal, Macromolecule Foam keeps the splint clean and dry. Available in Normal - 10.7 x 91.3 mm or Finger Splint - 95L x 45W X 6mm D.
Non stocked item. Usually ships within 5 days.